Daryl Johnson (Worcester Park, United Kingdom) on 30 November 2008 in Documentary & Street and Portfolio. 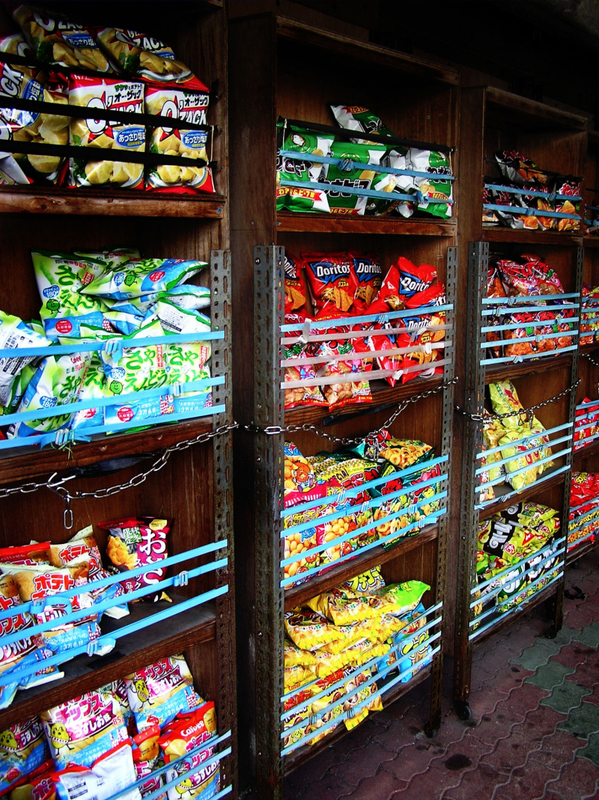 A rack of snacks on the street in Naha. The Japanese certainly have an interesting array of snacks. @Steve Rice: Yes Steve; are you a fan of Doritos? I like the repetition in this image! @Makoto: So many... maybe wasabi beef! What a festival of colours. I like the repetition here! Love the colorful collection of snacks. @Lorraine: Do you like the new chocolate covered ones Lorraine? What are the chains for? ...hearthquake?? Chocolate-flavoured Chips? are you serious? well wouldn't that be a taste!!!! The only think I recognize are the Doritos, but they'd be my last choice. @Twelvebit: Yeah... you know, I don't know anyone who likes Doritos! I like doritos :-) Beautiful colors!